Wondering if the Toyota Camry has enough space to comfortably transport your family and all their gear through Avon, Indianapolis, and Plainfield? 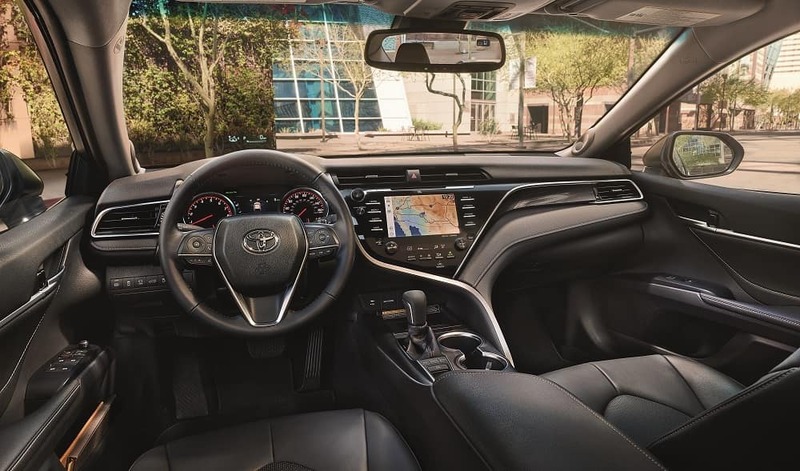 Andy Mohr Toyota is here to help you review the 2019 Toyota Camry dimensions in detail. Read on to learn all about the exterior, interior, wheel, and trunk dimensions in this reliable mid-size sedan! How Big Is the Toyota Camry? The Toyota Camry has a ground clearance of 5.7 inches, giving you some leeway when you encounter small bumps in the road. Plus, with a turning radius of 18.7 feet, you’ll have a slightly easier time making a U-turn than you would in the Honda Accord, for example, which has a turning radius of over 19 feet. When you’re going around corners, a larger track width provides better handling as well. The 2019 Camry has a track width of up to 63 inches in the front and 63.2 inches in the rear. This, plus the sedan’s relatively low profile, mean you’ll have plenty of stability around corners. In fact, the Camry is only 56.9 inches tall, making it shorter than both the Nissan Altima and the Honda Accord. With a max combined interior volume of 115.5 cubic feet, this Camry is squarely in the middle of the EPA’s mid-size sedan category. That space includes 99.3 cubic feet of passenger volume when you choose a model with a moonroof, or 100.4 cubic feet when you get a model without a moonroof. Either way, there’s plenty of room to comfortably seat five people. Whether you choose a model with a 6-way manual or 8-way power-adjustable driver’s seat, you’ll be able to find your perfect driving position with ease. Plus, with 38 inches of rear head- and legroom, your back-seat passengers won’t feel cramped. Every Camry trim level comes with all-season tires and a temporary spare. However, you’ll have your choice of wheel sizes. 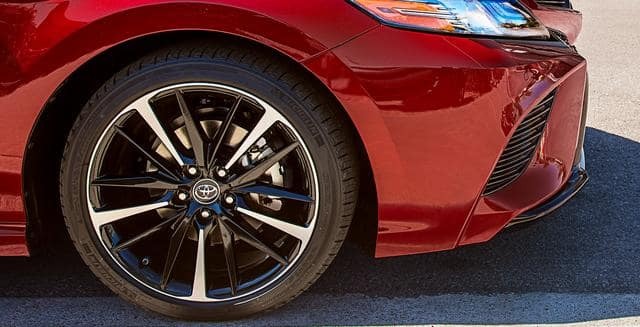 For starters, the Toyota Camry L comes standard with 16-inch steel wheels, which are paired with P205/65R16 all-season tires. You can also upgrade to available 17- or 18-inch alloy wheels on select models, or go for the Camry XSE V6, which comes with 19-inch black machine-finish alloy wheels and P235/40R19 tires. When you’re going from work to the gym, you want enough room in your car for your gym bag, work gear, and yoga mat. The trunk in the Camry can handle all that, plus a trip to the grocery store on the way home, with up to 15.1 cubic feet of cargo volume. The trunk is designed with wide hinges, making it easy to fit more luggage when you’re packing for a long trip. When you need to transport something larger, you can easily fold down one or both sides of the 60/40-split rear seats for more space. It can be hard to visualize what all these dimensions mean, which is why Andy Mohr Toyota invites drivers near Avon, Indianapolis, and Plainfield to come see the Toyota Camry in person. If you want to see for yourself what this mid-size sedan can handle, contact us today for a test drive at our premier Toyota dealership!